Tromso in the far North of Norway is well within the Arctic Circle and closer to Moscow than Brussels. 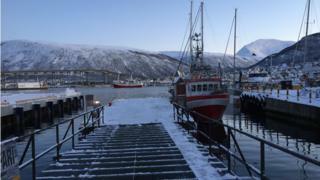 It is also a stronghold of Norway's fishing industry. From Tromso trawlers head out into the freezing cold Barents Sea for five weeks at a time searching for cod, haddock, mackerel and prawns. Tromso is also a bastion of Euroscepticism. During the 1994 referendum on whether to join the EU, the harbour of Tromso filled with trawlers all carrying banners saying 'Nei til EU' - No to the EU. Jan Roger Lerbukt was almost born with webbed feet, his massive hands bear the scars of many years at sea in rough, dangerous conditions. He owns and runs one trawler, the Hermes, which fishes in Norwegian waters - and that is the key. Norway is not part of the EU or its common fisheries policy (CFP), it manages and controls its own waters and fish stocks and they are thriving. Norwegians regard the CFP with disdain and as a result the fishing industry has been one of the bulwarks against Norwegian entry to the EU. As Jan explained: "We have made efforts to build fish stocks over many years, this is what we want to keep for the future, high well-managed stocks.. if I were to be asked today I would vote 'no'." But the fishing industry is not quite as anti-EU as it used to be. Three hours from Tromso on a fjord on the island of Senja, Fredd Wilsgaard showed me his salmon farm. In the freezing cold twilight - the sun doesn't rise here at this time of year - he showed me nets which hold 1.5 million salmon. Fredd has a problem: he can kill, and gut these fish, at a rate of 14,000 a day and sell them in the EU but he'd like to do more. Image caption Salmon farmer Fredd Wilsgaard is in the minority who would vote 'yes' to the EU. "A small amount of the fish we process here is made into fillets but I would like to do more, make smoked salmon, we could do ready-meals. "A part of the problem is that the taxes increase from 2% to 13%, if for instance we make smoked salmon. The more I do to the fish to make a ready meal the more the taxes go up, that is the price of being outside the European Union." As a result Fredd says he would now vote to join the EU, but he is in a pretty small minority and there is not going to be a referendum on joining the European Union in Norway anytime soon, not least because the polls show that up to 85% would vote against joining. Norway is a very prosperous country, much richer than most EU countries, with huge oil and gas reserves, but independence does comes at a price, and not just for the fish farmers. OSO Hotwater is a maker of central heating boilers just outside Oslo, and a few years ago it woke up to a nightmare. Overnight it discovered that the EU was introducing new environmental and energy efficiency standards that favoured gas powered boilers over electric ones. As OSO's boss Sigurd Braathen told me he did the calculations and realised that half of Oso's products would soon be useless: unsaleable. Now, as Norway is not a member of the EU, it has no say over these or any other EU rules. It can lobby against them, but it does not sit round the table when they are proposed, discussed, amended, debated, or voted into law. The consequences can be huge. Sigurd showed me how huge by walking from the wood panelled board room with its open fire and Scandinavian furniture to the factory floor next door. In the middle of the factory we stopped and he pointed down to the end of the shop floor and told me that everything from where we were standing to the end of the factory, perhaps 100 yards, was new investment. New machinery and robots that were needed to install better insulation onto the boilers -- in all it has cost the company £5m of extra investment. Now you may be wondering why, with a large domestic market, OSO did not just turn its back on the European Union and its new rules and ignore them. The answer is that it can't. This is a key factor of the Norwegian model; Norway is not in the EU, but it is in the European Economic Area (EEA), and technically it is as much a part of the single market as France, Germany or the UK. As Sigurd told me: "The legislation came from the EU and it was implemented in Norway without any alterations to the way we would have liked it to be. "It is implemented in Norway in exactly the same way as the rest of the EU and we can get no exceptions and no adaptations to Norwegian conditions. We have difficulties making alterations to any of the legislation we are getting." The single market is seen by many as one of the few true successes of the EU, more than just a free trade area it coordinates and enforces common rules, regulations and standards, so any manufacturer anywhere in the EU can sell in any other part of the EU. OSO and many other companies in Norway have to follow the rules of the single market even if they have never exported so much as a single widget to the European Union. That is just one of the costs of Norway's non-membership of the EU. It does a higher percentage of its trade with the EU than we in the UK do, in fact more than the vast majority of EU members do. But it pays hundreds of millions of pounds a year for the right to do that and has to accept all the rules and regulations without a say in how they are made. In the end OSO got lucky, the EU rules were watered down not because of anything that Norway did but because of French and Finnish objections. Originally the company thought it would have to spend £10m refitting its factory, in the end it cost just half that. But as Sigurd told me that was just "blind luck". You can hear Jonty's programme, Norway's European vision, on In Business on BBC Radio 4 at 8.30pm on Thursday 21 January.